The Bremerton Community Farmers Market welcomes farmers, food producers, prepared food vendors, artists and crafters, musicians, and non-profit organizations (see below) in our thriving market at Evergreen Park. If you are interested in becoming a vendor, please download and read our 2019 BCFM Rules and BCFM Bylaws. 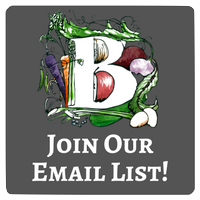 Then, download and fill out the 2019 BCFM Vendor Application and send it to our PO Box, along with your membership fee. Once your application has been received, processed, and approved, the Market Manager will send you a welcome email. 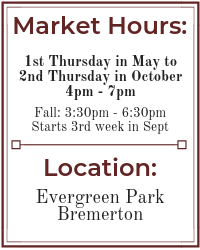 While Membership in the Bremerton Community Farmers Market is not required, it is recommended. Not only is there a reduced fee to participate in the Market with your Membership, vendors also have the right to vote and participate in the growth and governing of the Market. Regardless of membership, all vendors are expected to follow the same rules, as set forth by the Bremerton Community Farmers Market and the Washington State Farmers Market Association (WSFMA), of which the Bremerton Community Farmers Market is a member. The vendor category definitions, below, are from the WSFMA “Roots Guidelines”. All Vendor Definitions are below, as well as listed in the 2019 BCFM Rules For Community Members & Community Participants, please see the definitions & links below. Farmer: One who raises produce, plants or botanicals, or animals which they sell at WSFMA Member Markets on land they own, lease or rent, in the State of Washington. The definition of Farmer may also include someone who processes produce, fruit, berries, botanicals, meats, honey, etc., which is grown, raised, or harvested on their own, leased or rented property, in the State of Washington and then turned into value added product(s) such as jams, cider, salsa, vinegars, alcoholic beverages(*), essential oils or any other botanical use. It may also include Farmers who raise the basic ingredient(s) of a product, but who must send it out for fundamental processing, either within Washington State or border counties, before creating the value added product. *Please refer to 2019 BCFM Rules for a complete definition. Reseller: Sellers of crops that cannot be grown reliably, or are not offered for sale in sufficient quantity, by Farmers selling at a given WSFMA Member Market, as determined by the individual WSFMA Member Market’s governing body. Resellers must have all crops pre-approved by the Member Market’s governing body before delivering the crops to market for sale. Approved, resold crops must be specifically limited, so as not to compete with the crops of Farmers within the geographic vendor boundaries of the WSFMA Member Market, as defined by the Market’s policies and by-laws. Processor: One who sells foods that they have personally prepared or processed on property that they own, lease, or rent in the State of Washington. Processors are persons offering fresh food products (such as meats, seafood, ciders, wines, baked goods, jams, nuts, etc.) that have added value to their product through some sort of “hands-on” processing (e.g., hand-filleted fish, smoked or butchered meats, handmade candies/nuts, etc. ), but have not raised the ingredients themselves. In the case of Seafood vendors, product must originate from the greater Pacific Northwest, which includes Washington, Oregon, Alaska and British Columbia. Prepared Food: Prepared food vendors (Concessionaires) offer freshly made foods, available for sale and immediate consumption on-site at WSFMA Member Markets. Vendors should use ingredients produced in Washington State as much as possible. Artist / Crafter: One who creates with their own hands the products they offer for sale at WSFMA Member Markets. To qualify as an Artisan/Crafter, a majority of the tools and equipment used to produce their products must require skill, personal handling and/or manipulation. Artisans/Crafters should incorporate materials grown or produced in Washington State as much as possible and create their products in Washington State only. The Bremerton Community Farmers Market juries all artists/crafters prior to vending at the market. Please submit the vendor application with examples or pictures of art for consideration. Youth Vendor (Youth Farmer or Youth Artist): Vendor in any category listed above who is under 18 years of age. Parent or guardian permission to participate in the Bremerton Community Farmers Market is required. Member Vendor: Vendors who pay the seasonal Membership Fee ($50) and have voting rights at the annual meetings. Member Vendors pay a reduced stall fee, of $25 for a whole booth and $15 for a shared booth (space permitting) on each market day. Daily Vendor: Vendors not wishing to become members of the Bremerton Community Farmers Market are allowed to participate, so long as they follow all the market rules and are approved for participation via the Market Manager. The vending fee for Daily Vendors is $35 each market day. Space in the Bremerton Community Farmers Market is not guaranteed for Daily Vendors. Print an application relevant to your vending category and submit it to the Market Manager or to the PO Box listed on the application; all applications take at least seven days to process. Please indicate on the application that you do not want to be a Member of the Market. Entertainment: If you are musical group, singer, poet, juggler, or other type of entertainer, please send an email to the Market Manager for more information about participating in the Bremerton Community Farmers Market. The following businesses are NOT allowed to participate in the Bremerton Community Farmers Market, per WSFMA Rules, “unless said vendor falls within an ‘Exception’. In all cases, these items are restricted from being sold in a WSFMA Market because the products are either not produced, processed, or created in Washington State by the vendor, or funding, marketing, or other assistance given to vendors comes from a source separate from the vendor. However, vendors who are not allowed to sell at WSFMA Markets are allowed to sponsor market events/activities, as long as they are not selling or taking orders to sell. The Bremerton Community Farmers Market allows 2 free booth spaces per season for qualifying non profit and community organizations. Please visit our “Community Booth” page for full details. Please note: our Fall hours run 3:30pm – 6:30pm starting the 4th Thursday of September.